As I promised in my previous post from yesterday (Recent 9 Months U.S. Temperature trend/decade: – 0.7 F COOLER in 100 years), here comes the follow up with the 10 month historic trend for US temperature. As I said, all inspired by the shenanigans going on in Warsaw. Dedicated with “special love” to the traveling UN Circus now performing in Warsaw (COP 19 and CMP 9). 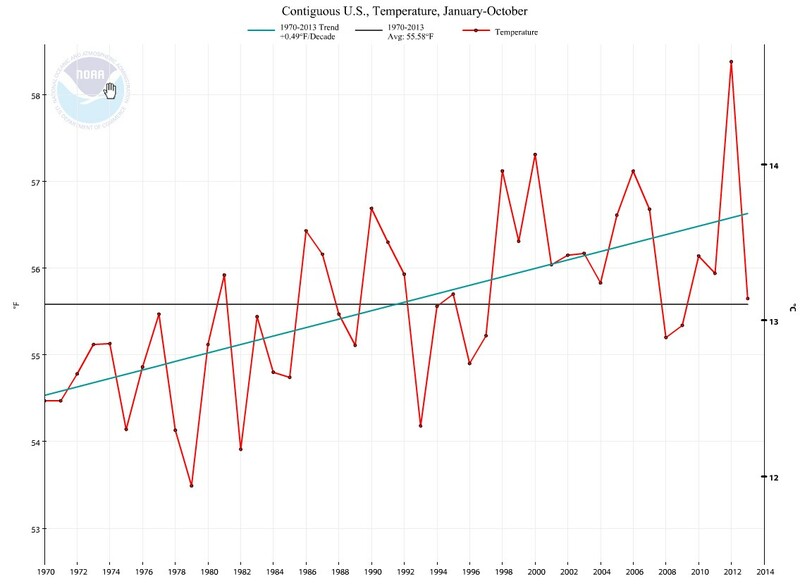 So here are the recent 10 months (year to date, January- October) US temperature from a “historic” perspective. To see how the decade trends have evolved during the last 113 years. I don’t know about you, but I consider a 10 month, a year by year consecutive trend 113 years long to be a “quit good” indicator. 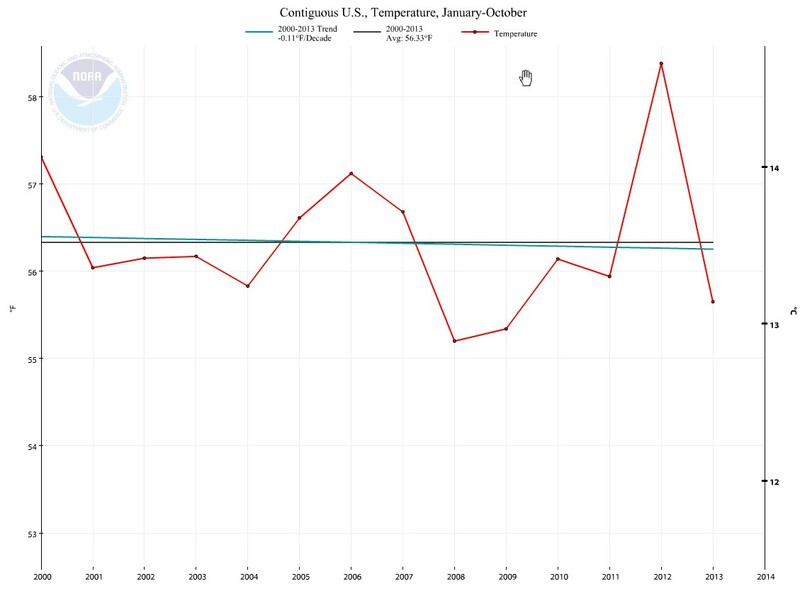 So the “warming trend” 2000-2013 for January – October is exactly – 0.11 F degrees a decade. That is – 1.1 F COOLER in 100 years. That’s what I call “warming”! You REALLY, REALLY can see the accelerating trend one month later can you not? The recent 10 months trend 1970-2013 is exactly 0.49 F degrees a decade. 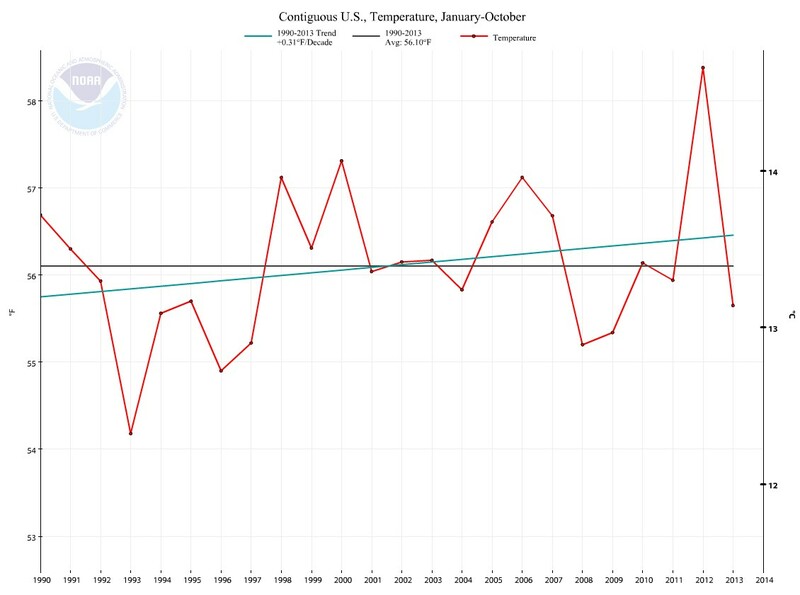 The recent 10 months trend 1980-2013 is exactly 0.42 F degrees a decade. 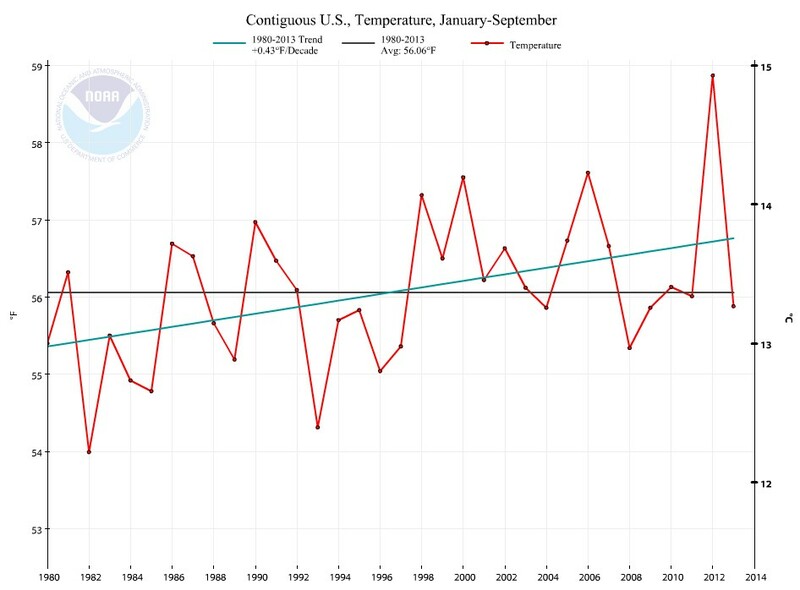 The recent 10 months trend 1990-2013 is exactly 0.31 F degrees a decade. 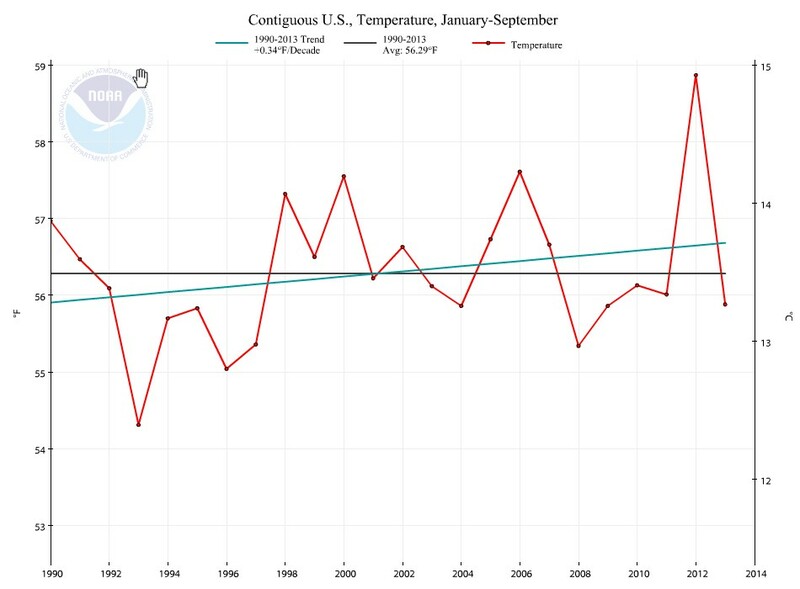 The recent 10 months trend 2000-2013 is exactly – 0.11 F degrees a decade. So to sum up these two last posts I am going to do an executive summary dedicated to our “intelligent” politicians, especially those now performing in Warsaw. And I am going to make a bold presumption here, namely that they know how to count, and even know the difference between + and – . You never know, there may be someone out there. If we compare this year’s 9 month trend with last year’s 9 month trend it is COOLER this year. And if we compare this year’s 9 month trend with this year’s 10 month trend it is COOLER. Can you now do the math and maybe draw at least some conclusions? Or is this too hard? And the cooling continues. Sorry – I mean that Global Warming is really an imminent threat to humankind. Especially in Warsaw. 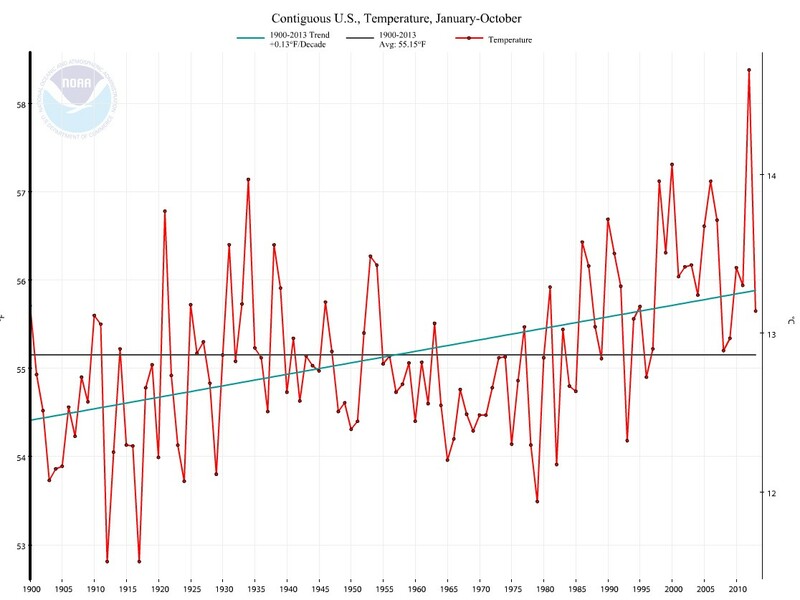 I was not planning to do another update of the US temperature from a “historic” perspective. But I was so inspired by the shenanigans going on in Warsaw that I felt I had to. So here it comes, first the 9 month trend and in a later post the 10 month trend. Dedicated with “special love” to the traveling UN Circus now performing in Warsaw (COP 19 and CMP 9). They were supposed to finish today but, as usual they have prolonged the proceedings. They have in negotiation speak “stopped the clock”. 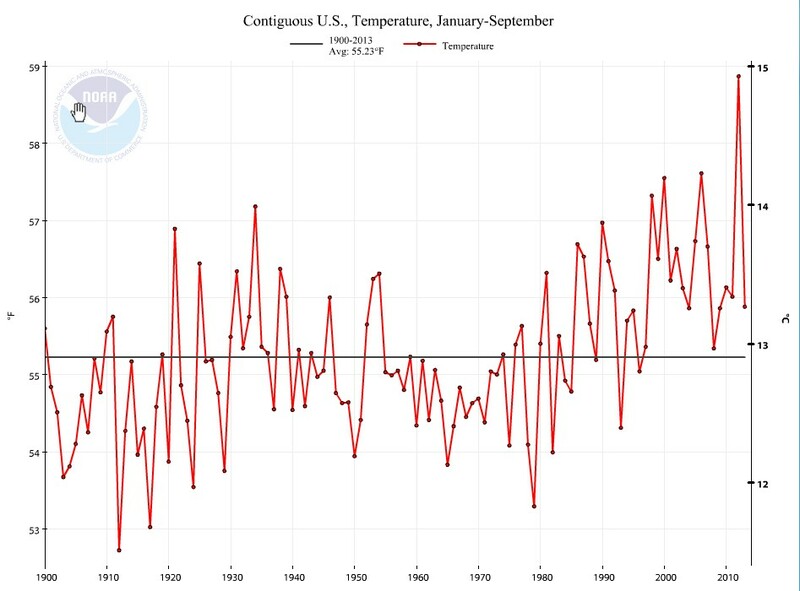 I thought it would be interesting to look at the recent 9 months (year to date, January- September) US temperature from a “historic” perspective. To see how the decade trends have evolved during the last 113 years. I don’t know about you, but I consider a 9 month, a year by year consecutive trend 113 years long to be a “quit good” indicator. 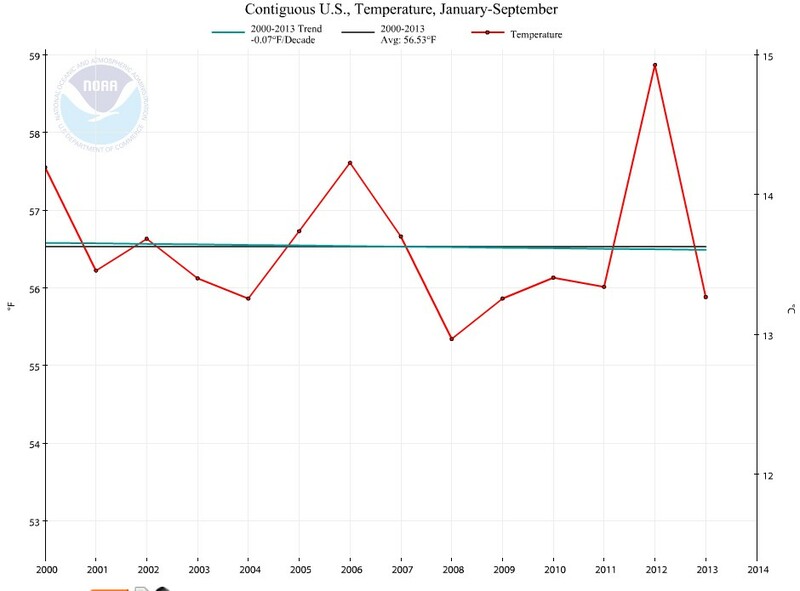 So the “warming trend” 2000-2013 for Jan- September is exactly – 0.07 F degrees a decade. That is – 0.7 F COOLER in 100 years. That’s what I call “warming”! You REALLY, REALLY can see the accelerating trend one year later can you not? The recent 9 months trend 1970-2013 is exactly 0.52 F degrees a decade. The recent 9 months trend 1980-2013 is exactly 0.43 F degrees a decade. 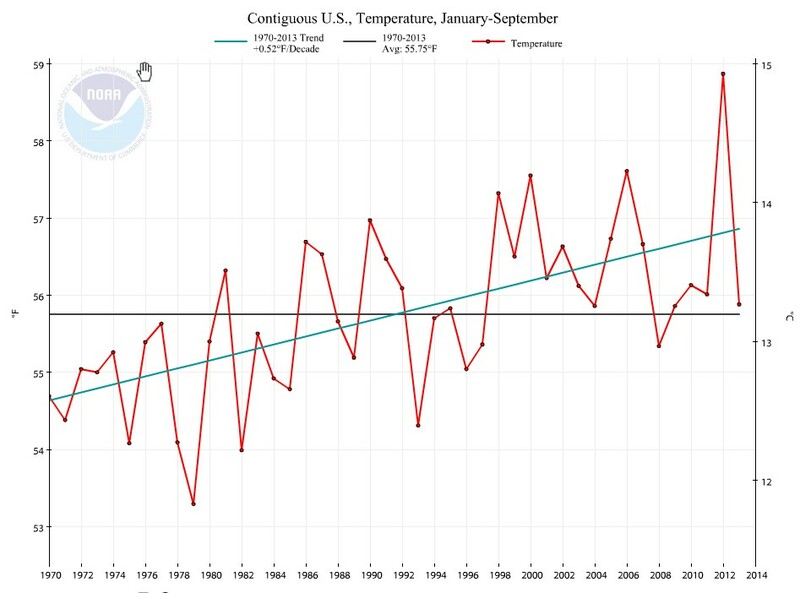 The recent 9 months trend 1990-2013 is exactly 0.34 F degrees a decade. 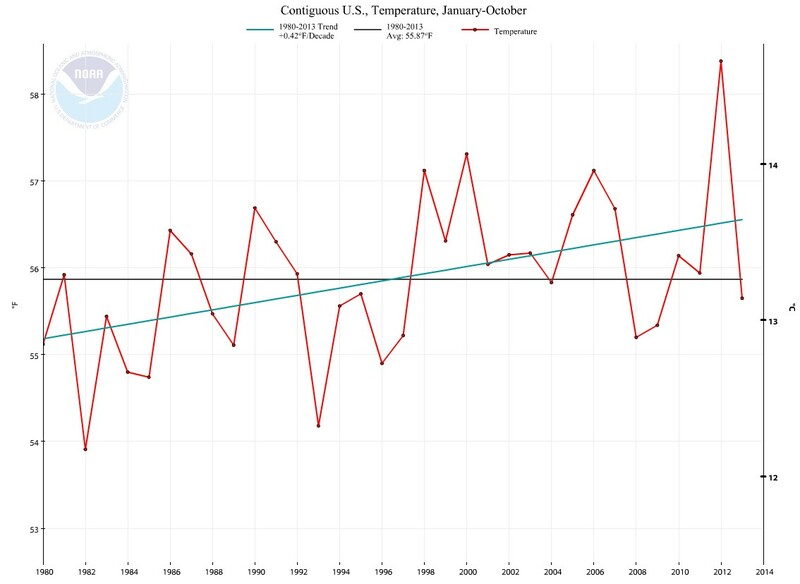 The recent 9 months trend 2000-2013 is exactly – 0.07 F degrees a decade.